Next spring, Spoiled Boutique owner Mika McCants’ lease will be up for renewal. She’s already paying $2,000 a month for her 400-square-foot storefront in Uptown Oakland, and she’s unsure how her shop will be affected if her landlord raises the rent. McCants was one of several local entrepreneurs who brought their worries to the Oakland Community and Economic Development Committee on Tuesday afternoon. The four committee members discussed a resolution calling for the creation of a task force that might encourage the city to support— – and to be in better communication with— – Oakland’s small businesses. “My question is, how will it be able to help me?” McCants asked committee members about the task force. Many of Oakland’s small business owners say they are struggling to stay open amid climbing rental costs and an increased minimum wage, which was bumped from $9 to $12.25 in March 2015, and rose again to $12.55 in January. Oakland Vice Mayor and City Council member Annie Campbell Washington (District 2) sponsored the resolution for a task force. She said the body— – which would be made up of local entrepreneurs— – would create a direct line between City Council and small business owners, who could then provide legislators with “facts, guidance and recommendations” that might inform more commerce-friendly policies. The committee recommended the resolution for City Council approval. Council member at-large Rebecca Kaplan said there is a dire need for better communication between the city and local entrepreneurs. For example, Kaplan said, restaurateurs have been particularly affected by Oakland’s garbage collection contract, which was renewed last summer. Business owners saw their collection bills jump by hundreds, and in some cases, thousands, of dollars. Oakland has the highest trash collection rates in the Bay Area, according to Washington. “If small businesses had been consulted throughout the negotiation process, a more just and fair solution could have resulted,” the resolution reads, referring to the garbage debacle. In addition to the increased costs of running a business in Oakland, entrepreneurs are also grappling with employee shortages. That’s because as market-housing prices continue to rise, tsome members of the working class can’t afford to pay rent in Oakland. As a result, fewer people are willing to work for the minimum wage that small businesses can afford to pay, Washington wrote in the resolution. Emily Goldenberg, owner of Caffe 817, told the committee she’s been short-staffed often lately. And it has her attention stretched thin. “My husband is working the [restaurant] line right now while I’m here,” said Goldenberg, who after the meeting rushed to pick up her daughter from school. Thumbtack, a start-up that connects service providers with customers, releases an annual report card that compares local small business environments across the U.S. 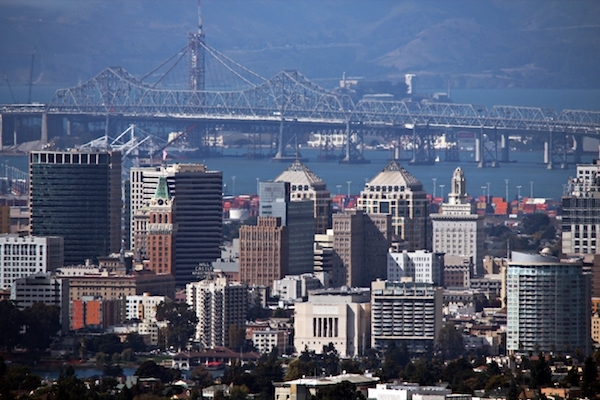 The company gave Oakland a “D” grade for employment, labor and hiring this year. The poor mark is noted in the task force proposal. Thank you for reporting this! I was totally unaware this was published! I was searching the web for a city council meeting calendar, hoping to read an update on the small business task force and came across this article purely coincidental! Wow! Must be God! BTW, I’m still seeking answers and solutions as to how the small business task force will be able to assist me! No word yet! :0(.